A decades-long friendship is put to the test when Serge spends 100,000 Euros on what his friend calls a white piece of crap. “Art” centers on Marc’s anger at his friend’s extravagant – and, in his opinion, pointless – purchase of modern art. Marc has come to see Serge as a pretentious, arrogant snob while Serge has come to see his friend as a bitter, condescending jerk. Their verbal sparring is unpleasant, raw, violent, and, in a strange way, captivating. Meanwhile, their mutual friend Yvan is caught in the middle, trying frantically to appease both men and to diffuse their fighting in order to salvage their treasured friendship. Given that he’s not directly part of the main conflict, Yvan may sound like a supporting role, but not as played by Andy Massingham. His physical prowess was astonishing: even when he was outside of the spotlight, I couldn’t take my eyes off his actions and reactions. Yvan can be at times pathetic and insecure, sycophantic and desperate, or just downright crazy and Massingham shows these instabilities with ease without ever losing the audience’s sympathy. Yvan was loaded with energy, emotion, and life without ever feeling stagey. While his cast-mates performed well, their characters felt two-dimensional and simplistic in comparison to Massingham’s tour-de-force performance. Sadly, even good acting from all three performers couldn’t save this show for me. Maybe something was lost in translation or maybe the European sensibilities of the script simply don’t suit me but I found the play too philosophical. “Art” contains a lot of monologues and dense dialogues that just didn’t ring true for me. Until the climactic fight scene, Marc and Serge seemed less like genuine friends and more like men discussing the nature of friendship and art. They didn’t really seem connected to or invested in each other at all. I also didn’t like the curios, antiques, and artwork strewn across either side of the main set. 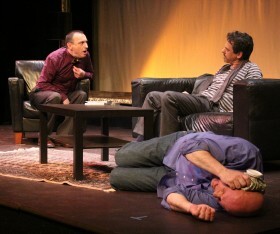 The action took place in a simple living room area with leather couches, a coffee table, and a very well-placed blank framed canvas (not the 100,000€ artwork in question, although it is displayed at various points throughout the play). The clutter that bookended this area was distracting and didn’t help to establish mood or tone. “Art” was effective in the sense that it thoroughly explored both the meaning of art and the meaning of friendship. At the end of the day, though, I just couldn’t bring myself to care about the characters and I left feeling unaffected by what I had just seen. But that’s just my opinion and I’d love to know what you think. Is “Art” a contemporary masterpiece of theatrical expression or is it a monotone piece of inexplicable modernity? What about Serge’s “art”: does it grab your attention or do you side with Marc? Let me know in the comments below. “Art” runs at the Gladstone Theatre until June 8th. For more information, check out our preview article. This play is worth seeing, to judge by the audience reaction on the first Saturday. The characters were clearly identifiable and fully engaged. Massingham’s Yvan was the dynamo that kept things rolling but Marinier’s tightly-wound Serge and Frisch’s laid-back Marc provided just the frame needed for this satire on middle-class social aspirations. The high-point of the piece, earning generous applause, is Yvan’s tour-de-force monologue, an outpouring inspired by a wedding invitation. 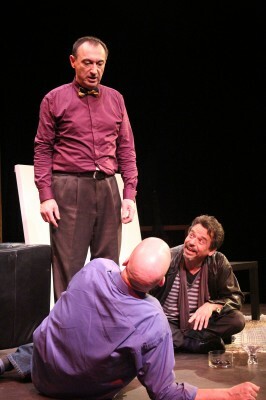 For more on this show, see Alvina Ruprecht’s review at the Capital Critics Circle website. I’m glad you liked the show. I definitely agree that Yvan’s meltdown over the wedding invitations was a big highlight. When I write reviews, personally, I try to avoid giving away any big or exciting details like that but you’re right that it’s something for audience members to watch for. Hope to see you out at more Gladstone shows!